Android RecyclerView is one the two UI widgets introduced by the support library in Android Lollipop. 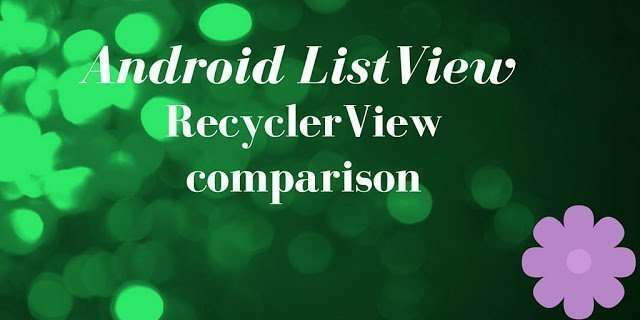 In this post I will describe how we can use it and what’s the difference between Android RecyclerView and ListView. This new widget is more flexible that the ListView but introduces some complexities. As we are used RecyclerView introduces a new Android Adapter that must be used to represent the underlying data in the widget. This new adapter is called RecyclerView.Adapter. To use this component you have to add latest v7 support library. We know already that in the ListView to increase the performance we have to use the ViewHolder pattern. This is simply a java class that holds the references to the widget in the row layout of the ListView (for example TextView, ImageView and so on). 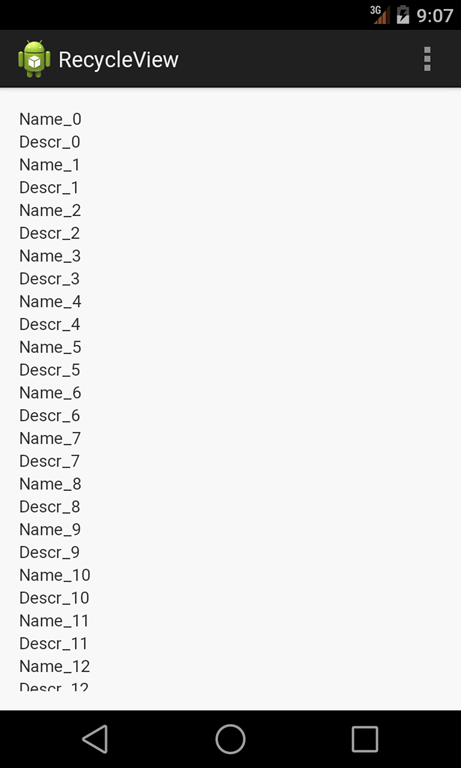 Using this pattern we avoid to call several times findById method to get the UI widget reference making the ListView scrolling smoother. Even if this pattern was suggested as best-practice we could implement our Adapter without using this pattern. RecyclerView enforces this pattern making it the core of this UI widget and we have to use it in our Adapter. As you can notice, the lookup process (findViewById) is made in the view holder instead of in getView method. Notice that we don’t make a lookup but we simply use the UI widget reference stored in our view holder. LinearLayoutManager is the “main” layout manager used to dispose items inside the RecyclerView. We can extend or implement our layout manager. The most interesting aspect is how many times the onCreateViewHolder is called compared to the number of items shown. If you look at the log you will find that the object created is 1/3 of the total number. Thanks for this. What replaced setOnItemClickListener() ? How does one detect clicks? Hi, great article. What does the “SO” stand for when you write “while the second method is called when the SO binds the view with the data…”? It’s just a typo due to the fact that the author is italian. SO stands for “Sistema Operativo”, the italian for Operating System. Hi, great article. What does the "SO" stand for when you write "while the second method is called when the SO binds the view with the data…"? It's just a typo due to the fact that the author is italian. SO stands for "Sistema Operativo", the italian for Operating System.